This is a new system that beats Roulette on the long run, despite its house edge of 5.26% on a double zero wheel or 2.7% on a single zero wheel. How is it possible to beat a game with negative expectancy? As the name implies, this system looks for a certain particular case, where you have more chances of winning than losing your sequence of bets. We know that nothing is due in Roulette and that the wheel has no memory. However, based on many years of experience playing and observing the tables, I noticed that a certain case has more likelihood to go our way, than to act in a totally random fashion. 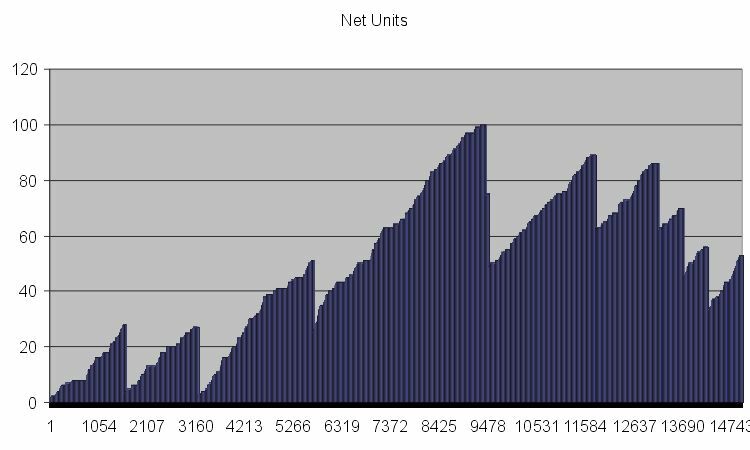 Playing the system live for the last 4 months, it generated lots of profits. Finally, I decided to run a computer simulation to see if this particular case will hold on the long run. To my pleasant surprise, it did. On the 15,000 Zumma tester book roulette spins, it generated 59 units and on randomly generated roulette numbers, it generates between 70-120 units on each sample of 15,000. This doesn�t seem to be much at first look. However, one does not play this system on one table only. One is centered in the middle of multiple tables and once the condition is encountered in a particular table, one is ready to apply the system. Thus tracking 4-6 tables at the same time, one can easily make 200 units for this amount of spins, as the simulation results are for one table only. This is a system, that keeps you alert and on the move at all times. Once every 15-20 spins or so, the opportunity will present itself on one of the tables you are watching. Then you go to that table and within 3 bets, you make your hit. You never remain on the same table for more than 3 spins. You don't sit at a particular table, waiting for the favorable condition. You will see it appearing just by observing the electronic scoreboards displayed next to each table. And it will be very easy to see the condition: the particular case. The great thing about this system is the satisfaction it will give you, as you will probably win more than 50 runs in a row, without losing or abandoning one. The cost of abandoning one session is not more than 26 units, which is your buy in. During many days, this is all you need to keep in hand. In fact, for the 15,000 Zumma spins, there is no drawdown. There is no time, where your balance goes negative, which is a tremendous achievement. We do realize, though, that Zumma is not real life. It's only a small sample. 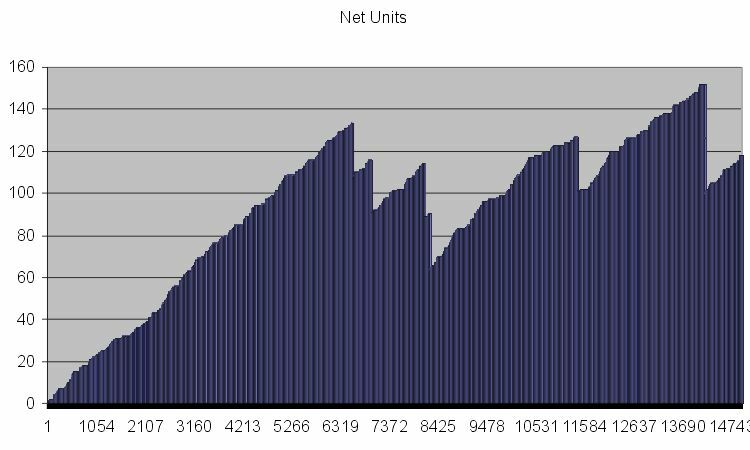 For 15,000 randomly generated spins, the highest drawdown ever encountered was 120 units and still ending all spins with a profit. Thus, we can say that a lifetime of 200 units would be sufficient to apply the system effectively. At $25 a bet, one can generate about 60 units within 3000 spins or $1500. With black chips, one can generate 4 times as much or $6000 ($2 per spin in average). And once one generates this amount, it is recommended to keep your profits and never give them back or lock at least 50% of it, put it aside and never use it. This way, should you lose your remaining gain, due to extreme unlucky cases, you will always have your initial profit of $3000. You can see that one generates 100 units quite easily, where you can lock 50 units and keep them at all times. The system is very easy to understand. It's not more than 8 pages, that will get you going right away and start winning. Your full satisfaction is guaranteed. Otherwise, you can claim your money back within 30 days of your purchase. The system is priced very reasonably at $85, which is nothing next to the thousands it will generate for you. Get your copy right now and keep it as your secret. By doing so, you will receive unlimited post purchase support and enhancement updates. Click here to order for an email delivery of the system. You can have a printout for $5 extra. You will receive the system document and a simulation designed for both 15,000 Zumma spins and 15,000 random spins, by the click of a button and change of one parameter.